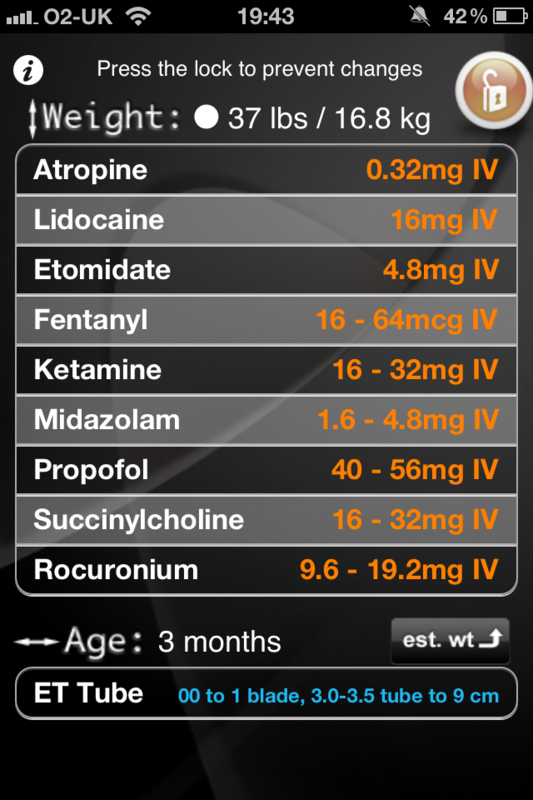 Calculating pediatric drug dosages correctly is highly important as a minor mistake can have a significant implication for the patient. To help pediatricians and anaesthesiologists, a range of medical apps have arrived on the market which aim to make this process easier. However, apps like Pedi STAT all rely on doctors inputting the right numbers into the app which is a potential area of error. Peds Airway, developed with support from the Emergency Medicine Residents Association, aims to simplify this process using a novel input interface. 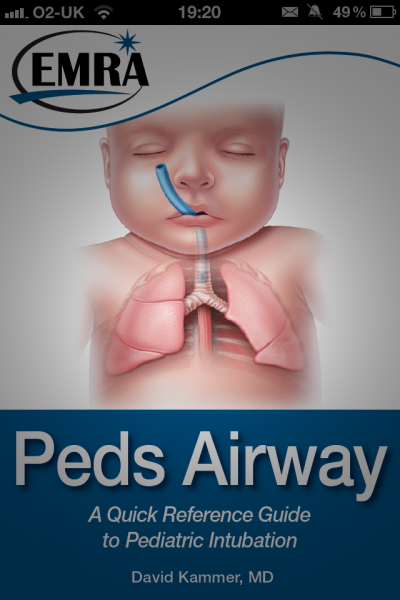 Peds Airway is a remarkably simple and effective app. When it opens, the user is presented with the screen shown below. 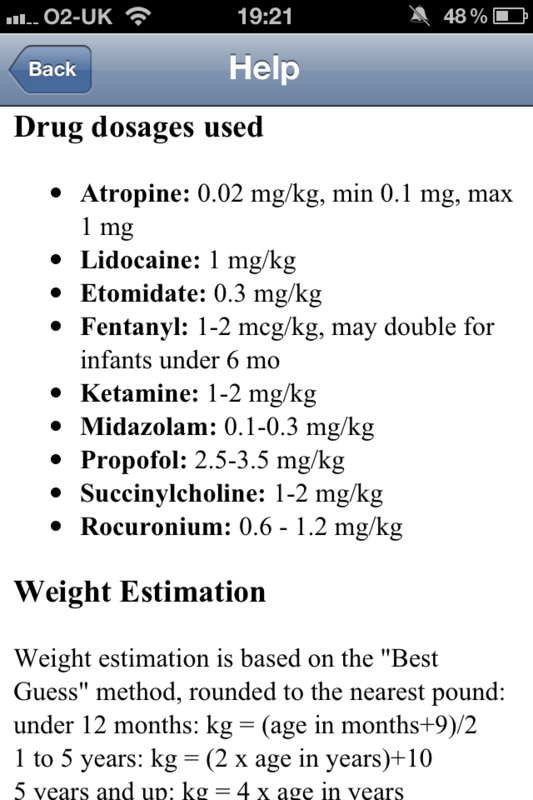 As you can see, the weight is displayed at the top, then there are 9 drugs and associated drug dosages. At the bottom there is an Age button and a button to estimate the child’s weight. The novel interface is the ability to change the weight of the child by simply dragging your finger in a vertical direction as if you were scrolling a page. As you do this, the drug dosages dynamically change as the weight increases. The dot next to the weight indicates the Broselow Color for patients under 36Kg. Drag left and right to set the age of the patient, and the suggested blade, endotracheal tube size and depth of insertion will appear. 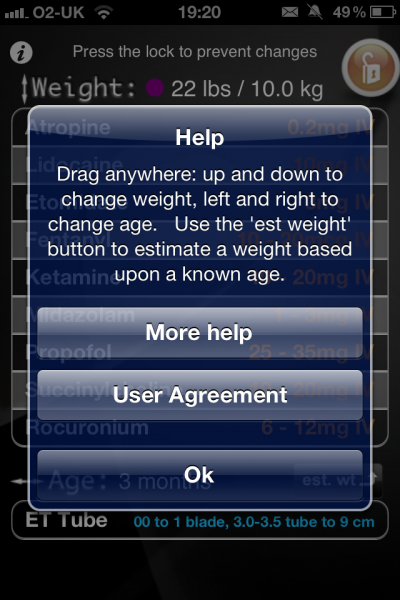 If you are unsure of the patients weight, then you can use the ‘Estimate Weight’ button which is based on the “Best Guess” method, rounded to the nearest pound. Once you have identified the correct drug dosages from the weight, you can ‘lock’ the screen using the padlock in the top corner. This will prevent any accidental scrolling of the drug dosages. Personally, I would like to see an enhanced lock system i.e. some sort of simple lock code as I would be worried that I might be able to inadvertently unlock the screen and change the dosages. Another thing to note is that the app does not remember your last weight/dosage if you quit it and then re-enter it. 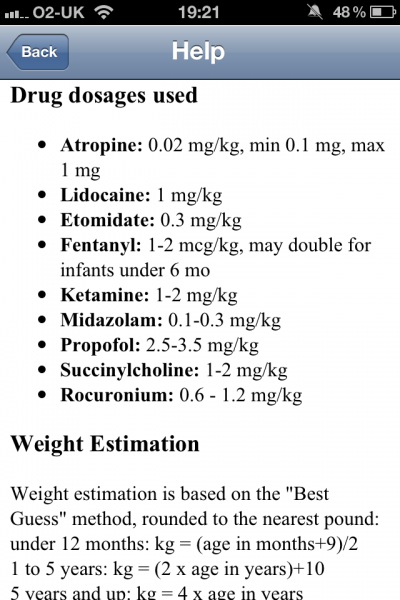 If you want to see the formula used to calculate the dosages and estimated weight, then these are accessible via the help page, although, there are no academic references given. EMRA Peds Airway utilises a number of simple yet innovative features to maximise the touch screen ability of modern mobile devices. 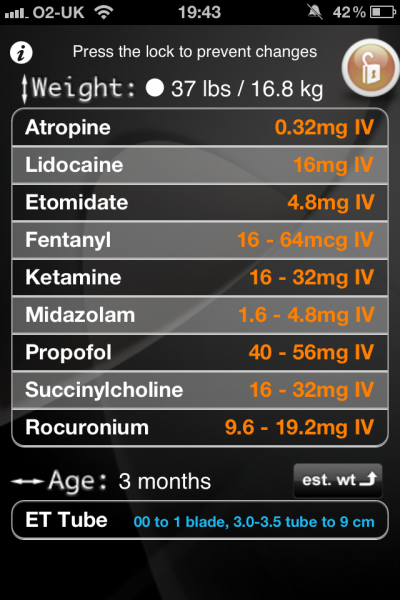 The ability to quickly and reliably calculate drug dosages under pressure is something that this app makes easy. One or two niggles do not detract from an otherwise simplistic yet impressive app.